An outdoor learning environment holistically weaves together themes of gardening, eating healthy foods, living sustainably, renewable energy, reclaiming water, and recycling-all in a package—an inspiration for the children and staff alike. 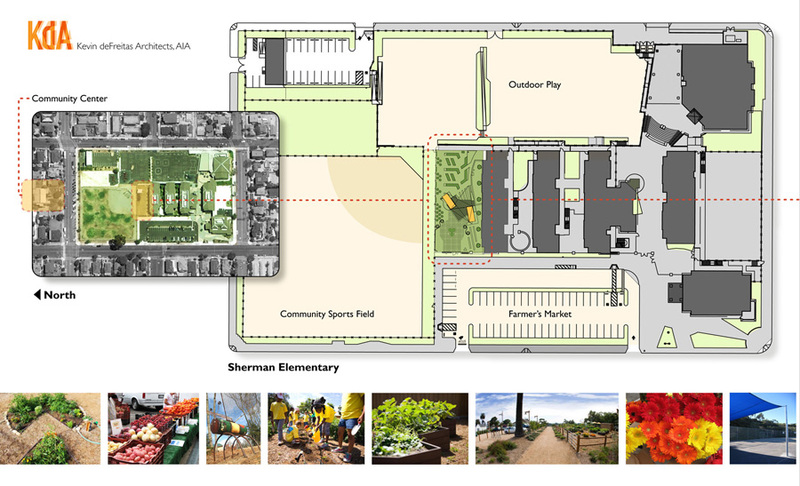 The Green Gardens Grow demonstration project will be constructed on a vacant 160 ’x 35’ plot of City School’s property on the campus of Sherman Elementary, located in a ethnically diverse neighborhood just east of downtown San Diego. The project will create an outdoor learning environment that holistically weaves together themes of gardening, eating healthy foods, living sustainably, renewable energy, reclaiming water, and recycling-all in a package that will be fun, understandable and inspiring for the children and staff alike. Whether the children are pondering math problems, creating art, learning science terms, or contemplating conservation ideas; each lesson will be enhanced by “garden-based learning,” a hands-on experience using nature as an educational tool. Perhaps the garden could be opened on weekends in conjunction with the adjacent empty staff-parking lot to support a neighborhood farmers’ market? It is hoped that this green garden oasis will attract more than pollinators, or inquisitive children, but in fact draw the surrounding neighborhood of Sherman Heights to this place designed to foster an appreciation of community-enriching, healthy, sustainable environments.